Panel Talk @ Foreign Investors Summit: Dream Big, Go Global or Stay Local? This month, our CEO, Calin Vaduva, shared his perspectives about the need for Romanian companies to go global and play internationally. The panel talk was part of Foreign Investors Summit, an annual B2B event organized by Business Review. The discussion followed subjects on recipes for going global, when is the right moment to do the step, but also how the management team tailors the business to cover international needs. Our CEO joined one of the panel talks that reunited leaders from companies based in Romania, carrying out their businesses in a wide range of industries from start-ups to technology and finance. “Going global is a major step, but also a primary necessity when the domestic market becomes too small for your business offer and vision. This scenario prevails for the Romanian software outsourcing providers. Since Romania is a small country, going global is the only option. Though growing outside the borders is a challenge, and the biggest trap for an entrepreneur is to spend too much time in the comfort zone. As an entrepreneur, you need to be keen on exploring new avenues regardless of the attached risks. It’s when you rise to new challenges and devote yourself to daring goals that you adapt, innovate and ultimately achieve business sustainability.”, underlines Calin Vaduva, Fortech’s CEO. Taking a small or emerging business global is a complex process. Once the business leaders agreed to play internationality, they may opt in for multiple ways to carry on the business expansion. Regardless of the path a company chooses, it always needs to keep the client in mind, pointed out Calin at the Foreign Investors Summit. As a company, you must understand the needs of your clients, be close to them, connect and create bridges. At first, you need to be open and travel a lot to your potential clients or take part in conferences, business mission or IT fairs. As you grow, you need to create a strong international sales team. One of the challenges emphasized by Calin is to build up account managers and business development managers with global experience. It takes time and money to do it, but this adds value to your business and new perspectives for development. The path can guide you to some mistakes on the way, but only by making them, you learn. In Fortech, concluded Calin, this approach makes us stronger and better. One of the reasons why some companies step in the international market is competition. In some situations, searching for unexploited territories can be a solution. Romanian market is a competitive one, as one of the speakers, Tax Partner at KPMG explained at the Foreign Investors Summit. Romania has a prolific fiscal jurisdiction: small taxes and on-holding legislation but lacks institutional thinking for a country that exports capital. The velocity of growth depends on the industry as well as on the context. Entrepreneurs need capital, mentoring and primary resources to prosper. They can find guidance in an accelerator, for example. Business accelerators can guarantee steady growth and be a viable option, as one of the panel members mentioned. According to an article published recently in Forbes, corporate accelerators are on an upward trend with benefits for both sides: the corporation is exposed to innovation and start-ups grow faster. Deloitte Consultants explained in a study that 50% of the corporate accelerators are within the technology, media, and telecom industry, compared to 23% that are in financial services. As for Romania, there’s a lot of room for improvement in encouraging entrepreneurs to go abroad and bring capital, fixing the trade deficit, as one of the speakers noticed. For more remarks about where the tech industry in Romania is heading, we recommend going through an exclusive interview with our CEO, published in the pages of Business Review magazine. 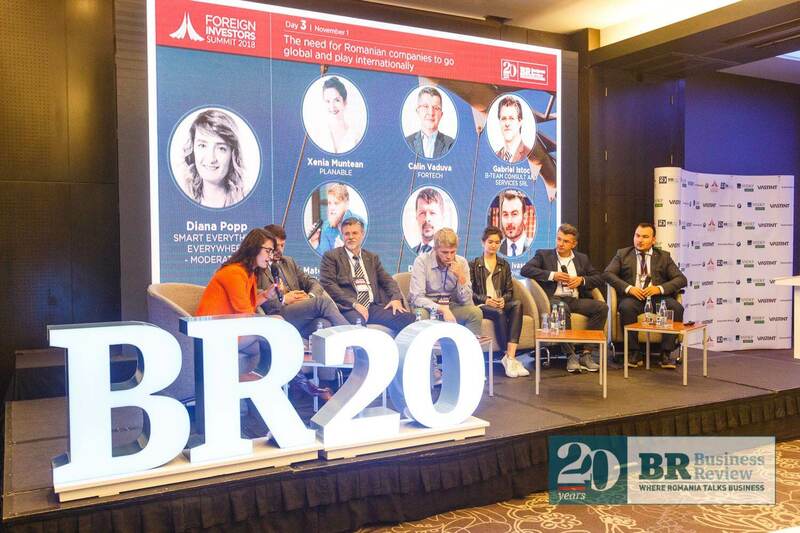 The Foreign Investors Summit is an annual B2B event organized by Business Review and dedicated to Romanian business’s strategies for competitiveness. The Fifth Foreign Investors’ Summit brought together for three days top-level Romanian and foreign service providers, public officials and key decision makers. A series of panels, dedicated workshops, and keynote speeches outlined Romania’s business future and offered solutions for a better ecosystem. © 2019 Fortech. All rights reserved. Romanian software development company, providing custom software outsourcing services for Germany and the USA.